Shows how ocean ridges are formed, lithosphere subducted at trenches; good for understanding plate tectonics. Author: Surachit. Source: Wikimedia Commons. Every aspect of our world is ultimately controlled by geologic forces far beneath our feet. Under the influence of mantle convection, mountain ranges rise, great rifts open in the earth, oceans form and then disappear. This is no exaggeration. We all learned about plate tectonics in high school; how the crust of the earth has split into plates that clash together and spread apart, forming vast continents and oceans. But did you know the force that moves these tectonic plates is the same force that cooks a chicken in your oven? That’s right, convection currents in the mantle are what help move tectonic plates around the globe! Mantle convection works on the basic principle that most things become less dense when they are heated. So rock buried deep within earth’s mantle, close to the core, tends to heat up and become less dense, causing it to rise through the cooler, denser material above it. When it finally reaches the top, it looses heat, becomes more dense, and then begins to sink back down into the mantle. This movement of material within the earth is what causes tectonic plates to move. 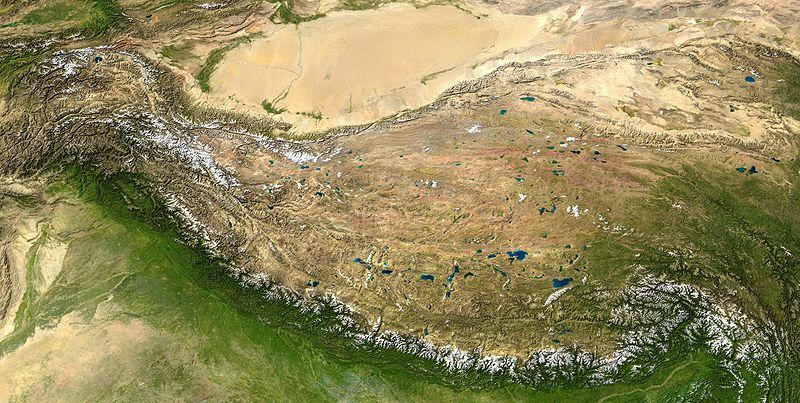 The Tibetan Plateau (top), perhaps the best example of a rain shadow. Rain does not make it past the Himalayas, leading to an arid climate on the leeward side of the mountain range. Source: Wikimedia Commons. The movement of tectonic plates has a lot of secondary effects that collectively have a big impact on our lives. For example, the Himalayas. The world’s tallest mountain range was created when India smashed into Asia millions of years ago. The tall mountain range acts a a barrier that blocks moisture coming in from the Indian Ocean to the South. It’s no coincidence that one of the World’s largest deserts lies just North of the World’s tallest mountain range. And the same rain shadow effect has lead to the formation of deserts pretty much all over the world. Where you can live is determined by plate tectonics. 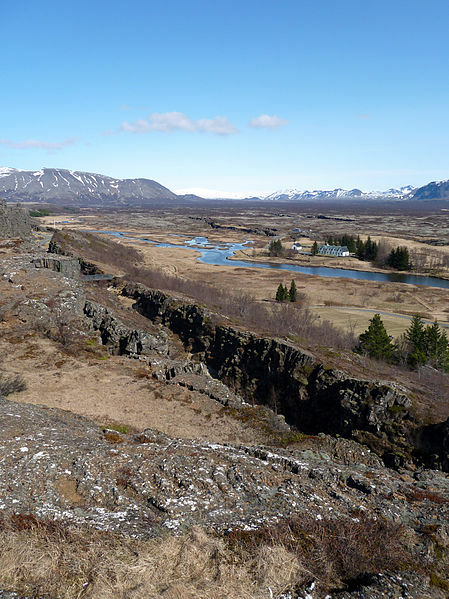 It’s not only the highest mountains that are caused by the movement of tectonic plates. Most oceans form around divergent plate boundaries, where tectonic plates are being pushed apart. Underwater divergent boundaries are called mid-ocean ridges. A mid ocean ridge is basically a gash in the earth located above where mantle currents are welling up. This upwelling of mantle material forms new crust and spreads the existing plates above it apart. There are couple of places where these ridge systems cross over land, including Iceland, which is famous for it’s volcanism, and East Africa, which is actively being ripped off of the rest of the continent. One day a large body of water will cover parts of Ethiopia, Tanzania, Uganda Kenya, Mozambique and The Democratic Republic of the Congo. Mid-ocean ridge in Þingvellir National Park, Iceland. Author: Rob Young f. Source: Wikimedia Commons. The deepest part of the oceans are generally where subduction zones occur. Subduction zones are where oceanic plates (being pushed from divergent plate boundaries) are forced underneath above-water continental plates. Deep trenches, like the Mariana Trench are formed at zubduction zones. Also, most volcanoes on earth are the result of subduction zones. All of this may not seem to have that big of an affect on our lives. I mean, so what if we can’t live in a desert, there’s plenty of other places to live, right? And we all love Oceans, right? But actually there were times in the past when this was not true. For example, the worst extinction event in Earth’s history occurred 250 million years ago. 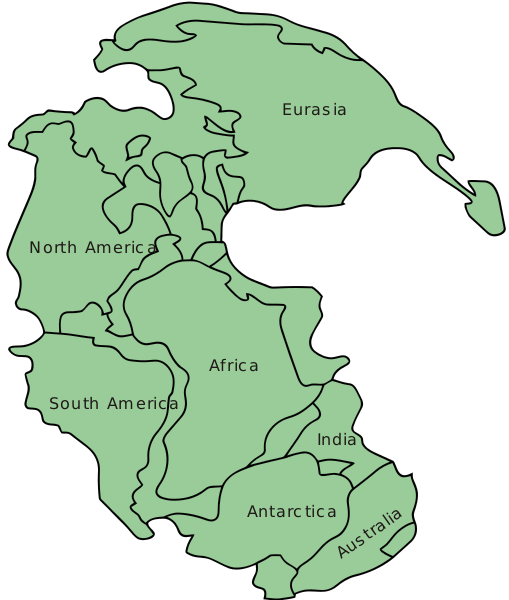 Ninety percent (that’s right 90%, i.e, almost all) of life on earth died out partly because all of the continents were were connected together forming one giant landmass called Pangaea. This altered ocean currents and destroyed many shallow marine environments that existed before. On top of that, at the same time massive lava flows in current day Siberia were pumping out gasses and depositing harmful pollutants that caused climate change and possibly also increased the acidity and temperature of the oceans. Every environment on earth was effected in one way or another by rising global temperatures, acid rain, and sometimes literally just lava. It’s true that volcanism happens today and deserts exist today and most of us are fine, but that’s only because we are lucky to live in a time where the position of the continents, the exchange of gasses in the atmosphere and a whole lot of other things are in balance. Pangea map, with names of the continents. Author: en:User:Kieff. Source Wikimedia Commons. Our entire existence is dependent on forces far beneath our feet and far beyond our control. Sound scary? Well you can look at it as yet another terrifying unknown in the cosmic scheme of things, or you can look at it as yet another miracle that has allowed life to flourish on Earth like no other place we know of. This blog only covered the very basic ways that Mantle convection influences our world on the surface. Without tectonic forces at work our earth would be a dead planet. Complex life may never have evolved and even if it did, arthropods or some other weird organism would probably be the dominant life form. It took a lot of chaos and destruction to get us where we are. On February 28th, Rice kicks of a really cool Continuing Studies course titled “Building Planet Earth.” If you thought this blog was interesting, then you should register for this this opportunity with renown professor Dr. Cin-Ty Lee, Chair of the Department of Earth, Environmental and Planetary Sciences at Rice. The course also includes a special session with Dr. Carolyn Sumners, HMNS VP of Astronomy. The grand finale is a tour of the Paleo Hall with Dr. Lee, and Sam Stubbs, trilobite collector. First session is Wednesday, Feb. 28 so register now. 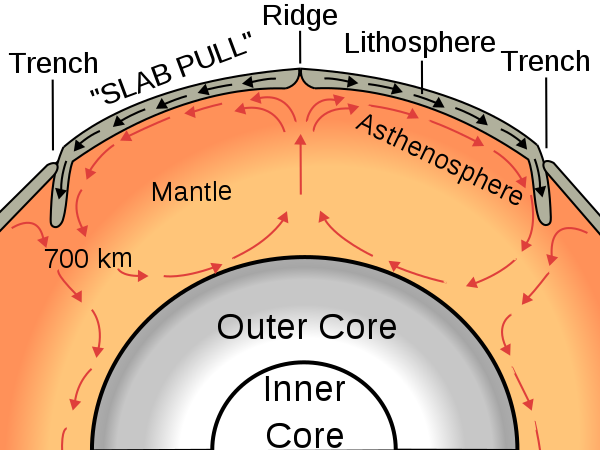 If after reading this blog you were left wondering “but wait, how did the core and mantle even form, are there any other effects that Mantle convection has on our weather, how did the earth even form and where did the moon come from?” you can get all your answers from the course.